If you're looking for a delightful gift that's full of heart, look no further than this beautiful bouquet. 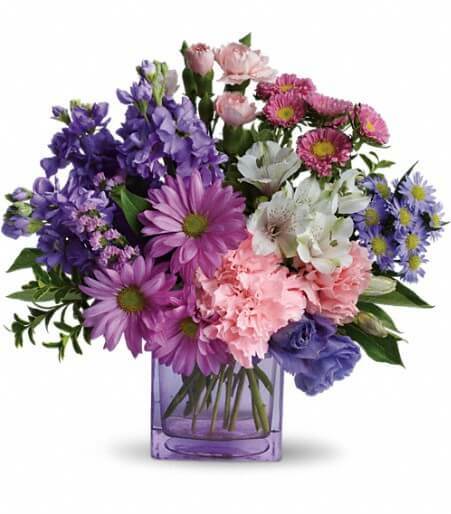 A pretty mix of beautiful flowers arranged in a cube vase will express your wishes perfectly. This stunning bouquet includes white alstroemeria, pink carnations and miniature carnations, purple lisianthus, daisy spray chrysanthemums and monte cassino asters, pink matsumoto asters, lavender stock, pink statice and greens delivered in a modern lavender cube vase. It's a heartfelt gift that's sure to delight. Vase may vary.